The Montblanc philosophy is for it’s creators to invest their souls in making exquisite eyewear to protect your eyes – the windows to your soul. Montblanc’s master craftsmen create eyewear that is a beacon of luxury which becomes a unique timepiece that is brought to life by its owner. Honoring a long standing European tradition of classic heritage and refined creation, each Montblanc creation becomes an heirloom which tells a story about craftsmanship and its soul. Montblanc eyewear brings elegance, vitality and effervescence to your life, a piece that will weather time and life’s story as it unfolds. 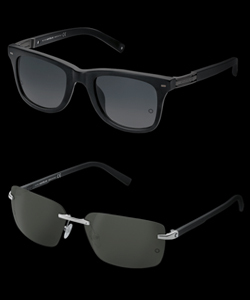 Offering a wide range of styles and a rich combination of materials, the Montblanc Eyewear Collection defines sophisticated luxury. With classic and contemporary shapes the collection blends, creativity, functionality and craftsmanship, with a passion for timeless quality. Each piece is created in Italy with painstaking attention to design and detail, creating a final product suited to individuals who seek only the finest in quality and elegance.